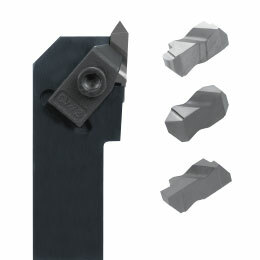 The universal grooving geometry is easily interchangeable with a wide variety of toolholders. The versatility of the Cera-Notch system is what makes this grooving and threading tool so popular. Cera-Notch System includes internal and external holders and inserts for grooving, threading, face grooving, and deep grooving. Kyocera cermets offer better surface finishes and tool life than coated carbides on steels. Kyocera's coated carbides offer better edge strength for high feeds and inerruptions. The best choice for stainless steel grooving.